Leaders from various organizations gathered in York City Thursday to voice support for increasing state minimum wage. Leaders from NAACP, state Department of Labor and other organizations fighting for $10.10 per hour. Dolores Minaya remembers not long ago working three low-paying jobs in York City and still coming home to find her three children in the dark with no electricity. That's why, despite recently receiving a raise to $10 per hour at her only job, she showed up Thursday afternoon to support a rally calling for the state to raise its minimum wage. The state currently follows the federally imposed $7.25 per hour rate. NAACP York President Sandra Thompson hosted the rally on the corner of North George Street and East Market Street in support of bills that would raise the minimum wage in Pennsylvania to at least $10.10 per hour. "We are in the 21st century, but hundreds of thousands of people are below the poverty line while working full-time," Thompson said, adding that more than 46,000 workers in York would stand to receive wage increases from the action. Kathy Manderino, secretary for the state Department of Labor and Industry, was present on behalf of Democratic Gov. 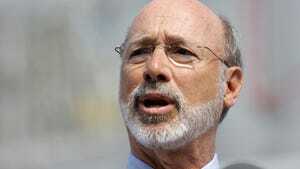 Tom Wolf, who has said he would sign a bill raising the minimum wage if it got to his desk. Wolf recently signed an executive order raising the minimum wage for state workers to $10.15 per hour. "Too often workers are forgotten," Manderino said. "It's time for us to do the right thing." Other speakers at the rally were Zach House of the Central PA Area Labor Federation, Paige Lower of PA Working Families and Martin Dees of the NAACP Economic Development Committee. "Our organizations are coming together to demand this increase," Lower said, pointing out that every state bordering Pennsylvania has raised its minimum wage. "The time for asking has passed." There are bills in the Legislature to up the minimum wage, but they have not seen much traction. One measure, Senate Bill 195, would take it to $10.10, and a second, Senate Bill 610, by Sen. Scott Wagner, R-Spring Garden Township, would gradually increase it 50 cents each year until it reaches $8.75 an hour. — Reach David Weissman at dweissman@yorkdispatch.com.